Electric Bikes – how can we maximise the opportunity? Steve Edgell, Chair of the Cycle to Work Alliance opened the session by pointing to the Cycle to Work Scheme as a ready-made mechanism for improving the accessibility of electric bikes, as the cost can be spread across a 12-month period with savings for the user. He noted that realising the full potential of electric bikes through the Scheme would require an increase to the Scheme limit, which is currently capped at £1,000. He highlighted that the average cost of a commuter quality electric bike is around £2,250, meaning that e-bikes are widely unavailable through the Scheme, and that amending the Scheme to ensure electric bikes could be accessed through the Scheme would expand the benefits to a wide range of people – including older people who might be unable to walk or cycle long distances, those on lower incomes, those with high travel costs and disabled cyclists. In his closing remarks, he called on government to consider how the Scheme could be used to increase the uptake of electric bikes, and open the market to new demographics who may not have cycled previously, and reiterated the case for the Scheme as a ready-made mechanism for delivering a step change in electric bike usage in the UK. Will Butler-Adams, Brompton Bicycle Ltd highlighted that the UK is behind Europe in the electric bike market, and that a lot could be learned from the approach taken in different European countries. 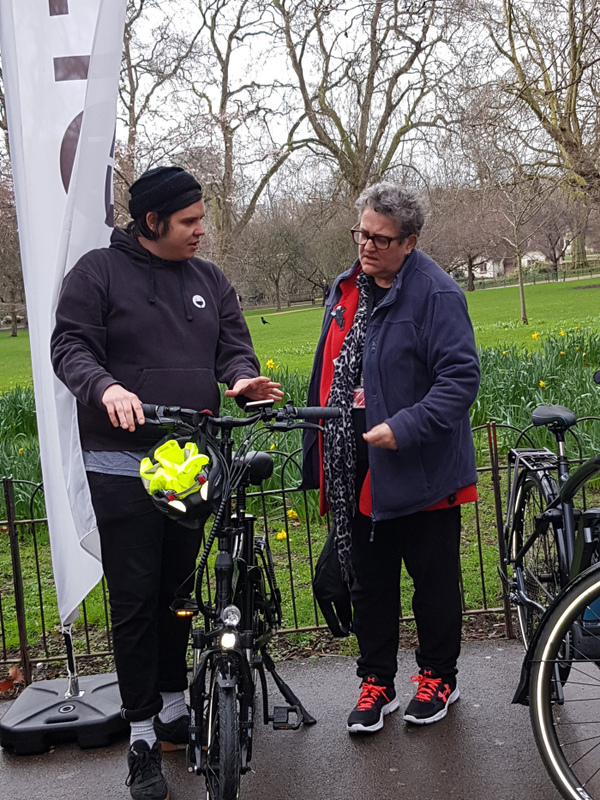 He went on to outline that the UK has a mental health and obesity challenge that can only be addressed by a string of public policy initiatives, and that electric bikes could play a role in addressing these challenges. Mr Butler-Adams said that the Cycle to Work Scheme is a tried and tested ‘nudge tool’ of achieving an increase in cycling, so it could be extended to catalyse electric bike purchases. Overall, he pointed to the affordability of electric bikes – rather than cost alone – as a central barrier to increased uptake, arguing that the Cycle to Work Scheme would be the ideal mechanism because it is a tax efficient, salary-sacrificed employee benefit. Laura Dyett, Behavioural Insights Team, Transport for London expressed TfL’s full support for policy changes to support the uptake of electric bikes, noting that it would be particularly beneficial for those over 55 years old, women, those with mobility problems, and those who face long journeys. Ms Dyett suggested that the cost of electric bikes was still “prohibitive” for many, and that a decrease in costs would need to be accompanied by a wide-ranging educational piece on electric bikes for there to be a marked increase in up-take. She closed her remarks be referencing a new website launching from TfL on Friday 16 March 2018, suggesting this might be something local authorities could replicate. Phillip Darnton, Bicycle Association wished to put on record his support for an increase in the scheme limit. 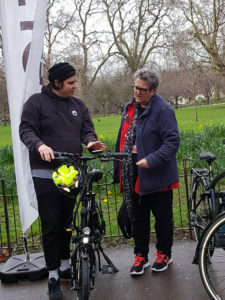 Baroness Barker, Liberal Democrat Spokesperson for the Voluntary Sector and Social Enterprise, referenced Brixton-based disability cycling charity Wheels for Wellbeing, adding that adapted bikes had been tried out but struggled to gain widespread take-up from the disabled community. She questioned whether using an electric bike is “cheating” on the physical benefits of exercise. Will Butler-Adams replied that the scheme uplift is not a silver bullet for a health public policy benefit but is a “no brainer” nonetheless. Terry Blackwood, Raleigh UK Ltd asked the panellists what data and evidence would be required to make the case to government and the Treasury for a scheme uplift. A representative from Volt Bikes argued that there need to be additional incentives other than a scheme uplift because some groups in society – namely the retired – would not benefit from a work-based employee benefit. Andrew Selous MP, Co-Chair of the APPG on Cycling said a list of available schemes and subsidy mechanisms may be instructive in reaching social groups and asked whether different legislative mechanisms had been considered. Derek Craig, Free2Cycle suggested that the Treasury may be reluctant to increase the Scheme limit if it would only benefit higher rate tax payers, as this would only generate a short-term benefit for the Treasury. In response, Steve Edgell pointed to data which shows that a majority of Cycle to Work Scheme users are basic rate tax payers. Dan Jones, Riese & Muller asked whether Office for Low Emission Vehicle grants could be used to subsidise the cost of electric bike development and production. A representative from the Motorcycle Industries Federation said there needs to be clear rules on the definition of an electric bike. Roger Geffen, Cycling UK questioned how far the Cycle to Work Alliance and the APPG are “pushing at an open door” if the Office for Low Emission Vehicles could provide subsidies to electric bikes, alongside funding for electric and autonomous vehicles. Adrian Warren, Cyclescheme pointed to existing figures that show how electric bikes can encourage cycling participation amongst demographics who may not otherwise cycle, adding there is a core of 500,000 new cyclists who could be the target market for an uptake in electric bikes. Could this approach be trialled elsewhere in the UK? Electric bikes continue to be more expensive than normal bikes, the average cost of a commuter quality electric bike is around £2,250. This means they are unavailable through the Cycle to Work Scheme. Government has argued that the price of electric bikes will fall over time, however there is no evidence that this is happening. Despite this, electric bike sales have grown from 5 per cent of UK bike market in 2015 to 12 per cent in 2016. Halfords saw a 220 per cent increase in its sale of electric bikes in 2017. A recent survey of 2,000 commuters commissioned by Evans Cycles projected that by shifting from bus, car, train or tube to electric bike, travellers could save an approximate amount of £8,000 over 5 years. This growth in the use of electric bikes is positive. However, the benefits of electric bikes are limited to those able to afford the upfront cost of purchasing the bike and equipment, excluding many demographics who would benefit greatly from the assistance of an electric bike. The Scheme is a ready-made mechanism for improving the accessibility of electric bikes, as the cost can be spread across a 12-month period, and results in savings for the user. The Alliance thinks that an increase in the uptake of electric bikes will benefit a wide range of people, expanding the Scheme to people who need to travel further or require additional support. We think it will be particularly beneficial to older people who are unable to walk or cycle long distances, and do not have access to good public transport. Electric bikes allow people to cover much greater distances with relative ease. It will also benefit those on lower incomes, and those with high travel costs. And disabled cyclists, or those who have difficulties cycling longer distances. The Cycle to Work Scheme is a ready-made mechanism for delivering an increase in the uptake of electric bikes by improving accessibility and affordability of the product. This would require fewer legislative changes or additional funding than the development of a specific electric bike subsidy. The Scheme is a recognised and valued employee benefit, and expanding the range of equipment accessible through the Scheme would not require the establishment of a new system for processing payments or Scheme usage. However, the vast majority of electric bikes are not currently available through the Scheme, because of the £1,000 limit – the average cost of an electric bike is over £2,250. Where employers offer an increased limit because they hold their own Consumer Credit Authority, average uptake of the Scheme is 50 per cent higher. Realising the full potential of electric bikes through the Scheme would require a revision of the limit, but would expand the benefits of electric bikes to a wide range of people. This change would require minimal resource from government, and could be achieved through the revision of the Scheme guidance currently being undertaken by the Cycle to Work Alliance and the Department for Transport. The Alliance would like to see a meaningful change to the Cycle to Work Scheme through the revision of the guidance, and think that improving access to electric bikes would be a step forward in the evolution of the Scheme. We are calling on government to consider how the Scheme could be used to increase the uptake of electric bikes, and open the market to new demographics who may not have cycled previously.